Drain cleaners are typically service providers that open minor blockages of sewers and drains. Blockages result in backups and overflows. Unless promptly dealt with, damage to the interior of homes and businesses can occur from water or wastewater damage. The unpleasant interruption of the use of toilets, sinks and showers calls for immediate attention. Historically, devices that have been used to open sewers include rotating cutters that can be inserted in a plugged drain line. Often the problem may arise from foreign objects introduced to the system, roots in sewer lines, collapsed pipe and offset joints. Cutting devices have been proven effective in opening sewers. Root cutters are typically electrically powered "snakes" that have a steel cutter on the end that can open sewers. These cutters can cut through plastic gas distribution, communication, water and other utilities inadvertently installed through sewers. 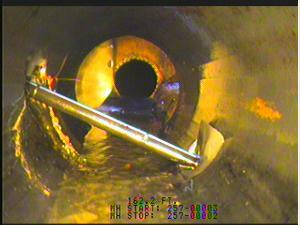 If a cross bore is in a sewer line that is being opened by a root cutter, the utility line can be cut. If it is a gas line, gas will be introduced into the connected structure. In a matter of a few moments, gas/air concentrations can reach the explosive range. Sparks from electric motors and switches or pilot lights for water heaters and furnaces can ignite the gas/air mixture with catastrophic results including explosion and complete destruction of the structure and death. If electric lines are hit by the root cutter, shock of the operator can result in injury or death. Other utilities used for communications normally will not cause immediate injury, but communication with emergency services such as police or fire departments is in impeded. Delayed response then can be result in loss of property, injury or death. Push rod cameras are ineffective in identifying a cross bore if the line is already backed up with water/sewerage. The visibility is limited. Drain Cleaner Safety is Important! 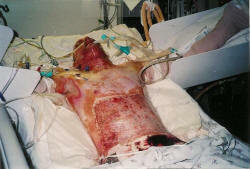 This technician required 17 operations after surviving a gas cross bore explosion. If the local utility has a marking program for identifying sewer connections that have been inspected and cleared as not having cross bores, become familiar with the program. Recognize that gas utility lines are most often of plastic. Notice if plastic is on the cutting tool when the cutter is withdrawn for inspection. Other types of utility lines may have similar characteristics to observe. If bubbles or gas are found to be escaping from the entry point of the cutting equipment, IMMEDIATELY exit the structure. In such case warn all inhabitants as well. Do not flip any switches or use any type of phone until clear of the structure by a safe distance. Since the structure can explode radially outward distances of 150 ft or more retreat to a safe distance. Do not go back into the structure under any circumstances. Once safely clear of the structure call the emergency number, fire department, police and/or the local distribution utility. Utility distribution employees have died upon entering a structure where a gas leak had been reported. Safety personnel should proceed with due caution. When deemed appropriate and with concern for personal safety, notify adjacent property owners. In a gas the explosive force and debris can be lethal at a great distance. 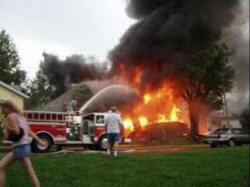 Adjacent structures may not be safe locations as well. In a gas explosions the damage adjacent structure or, in some cases, a cut gas distribution line can cause other structures in the vicinity to have gas pressurized into them making them also lethal. Do not return until professionals have cleared the area and structures. Referred to as "root cutters" , rotating cutters mounted on a flexible drive that is inserted into a drain. The inserting point may be at a sink, bath drain, vent pipe or removed toilet. The cutters are capable of cutting roots and also plastic pipe. Video cameras that are approximately 2" in diameter mounted on to a flexible, but stiff cable, that can view and display up to 200 ft of pipe from the inside. Usually used on smaller pipes of less than 8" diameter. Can be used from inside of structures at drains and toilets. Unfortunately, are unable to have good visibility once a drain line is backed-up and full of water or wastewater and debris.